Up to 20" x 30"
These snap poster frames are great for offices, theaters and stores because they make graphics easy to change. We carry a large selection of sizes, ranging from as small as 5" x 7" to the large 40" to 60". Our finish options include black, silver and wood grain for perfectly accentuating any artwork or graphics. 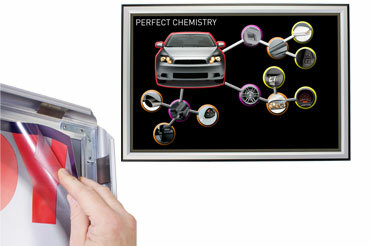 However, all displays are made of durable aluminum and have a cost-effective and easy to use design. The snap poster frames allow users to the most of walls and counters by turning them into advertising spaces or artwork showcases. They are especially useful because graphics can be changed without taking the fixture off of the wall. 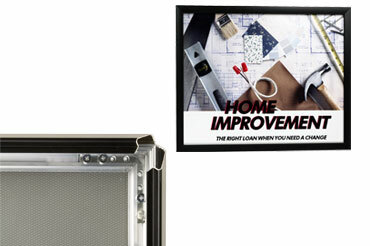 Because of this, these snap poster frames, also known as sign holders, can be useful for businesses that need to change pictures often, or organizations that want a simple, affordable way to display graphics. Are there different types quick change mounts? We offer a variety of sizes of snap poster frames, including smaller units up to 20" x 30" for pictures and photos, 22" x 28" models for medium-sized graphics, and holders measuring 24" x 36" and up for large signage. The smaller sizes are great for wall mounting, but some come with an easel stand for table or countertop use. These frames will fit almost anywhere! The mid-range size of 22" x 28" are great for marketing in businesses like real estate offices and travel agencies. This type of frame is large enough to easily catch attention, but small enough to fit on most walls. 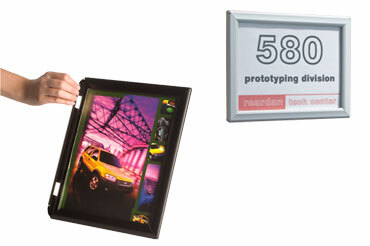 The large 24" x 36" front access enclosures are ideal for advertising on a bigger scale. These poster frames can be used in trade shows, conference rooms, outdoors or any large venue. Standard sizes for movie prints, namely 27" x 40" and 27" x 41" are also available. With sizes reaching 40" x 60", it’s easy to have your custom printed graphics, logos or prints seen by clients and customers. 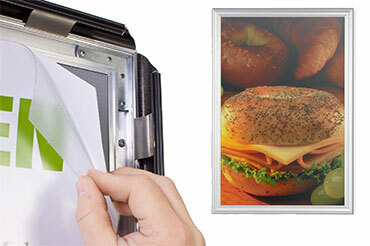 With their quick-change design, these picture frames are great for menus in restaurants, showing houses in reality offices and displaying limited time offers like "50% off!". Of course, they can also be used for more permanent displays, and will last for years with their strong aluminum fabrication. Their thin design allows them to be used in tight spaces like small rooms and hallways, especially the smaller models, which are often used as wayfinding signage. Each unit features fast same day shipping, so order today on SnapFrames.com!